After experiencing NETGEAR’s previous generation NeoTV NTV200, with solid function, value and distinction as one of the only media streamers with HDMI CEC support it was genuinely exciting when the NeoTV MAX (NTV300SL) arrived with a dual-sided QWERTY remote, full VUDU 3D and Netflix multichannel audio with subtitle support–that NETGEAR only asks $70 (MSRP) for the device was gravy. With the NeoTV MAX also promising 24p and continuing the tradition of seamless integration into a HDMI CEC controlled ecosystem it seems likely that NETGEAR would deliver the perfect Over the Top (OTT) streamer for the most demanding users. 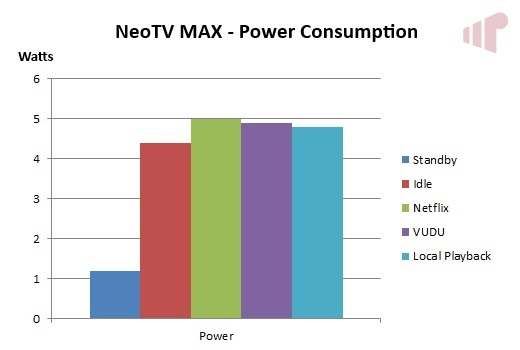 The NETGEAR NeoTV MAX tops the current generation of NeoTV OTT media streamers. Like its lesser siblings it boasts 1080p video, Dolby Digital Plus (DD+), wireless and wired networking connectivity. Where it differs however, is with features like the QWERY remote, WiDi, VUDU 3D, DLNA and local file playback either via USB or microSD. 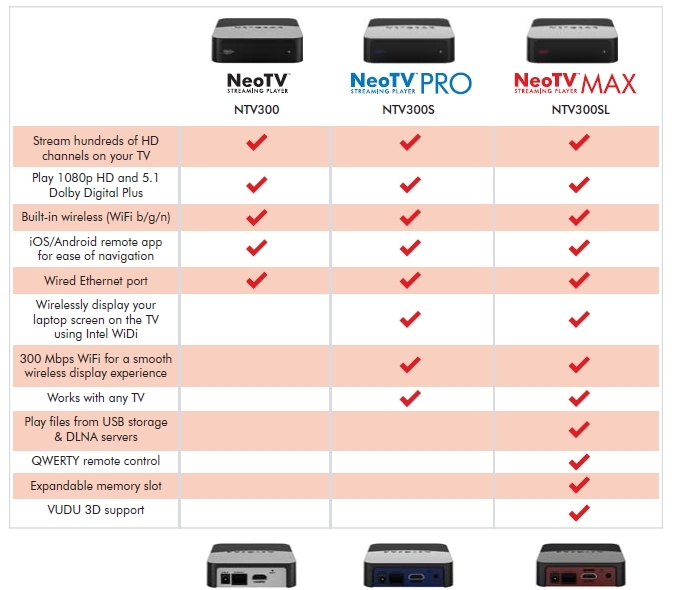 Starting at $50 and moving up in $10 increments, none of the NeoTVs will break the bank–so while the NeoTV (NTV300) and NeoTV MAX (NTV300SL) clearly belong to hitting important price points the NeoTV PRO (NTV300S) is oddly placed lacking functionality far in excess of the $10 discount versus the MAX. If you have any familiarity with little-black-OTT-streamers, the NeoTV MAX looks exactly as it should: small and square it packs a lot into its standard sized chassis. The remote is functional, but not nearly as tacitly rewarding as what we find in more expensive devices. The buttons are squishy, and operating the QWERTY remote is a bit clunky as you need to press a button on the bottom to activate it – no orientation sensor here. That said, given the MSRP (both actual and relative) it is difficult to be too critical of the remote–it works and the direct access launch buttons are great (especially if you will be swapping it out for a universal), and access to a QWERTY keyboard when joining a wireless network or searching for content is welcoming. Cracking the box we find a MediaTek MT8653GAG SoC and a simple heatsink and pad to cool it. I was not able to run down the specifics on the chip, but there were some older models listed on MediaTek’s website which indicate that it is very capable when it comes to CODEC support – something that was validated in testing with Blu-ray quality H.264/AVC, VC-1 and MPEG2 all rendering properly. 4K AVC did not work however, but it had no problem with the much more common 1080p60 or 1080i60 which can cause issues in competing hardware. Container support was also notable for a streamer of this type with MKV, M2TS, TS, MPEG, MP4 & WMV all working to some degree. The NeoTV MAX was also generous on the audio side with bit streaming support for HBR formats like Dolby TrueHD (M2TS)/DTS-MA (M2TS and MKV) as well as standard Dolby formats, DTS and multi-channel PCM (all relevant containers). The first run experience is critical in the consumer space, and NETGEAR gets it right. No issues were noted, with the proper screen resolution and audio configuration set automatically and the network detected effortlessly. Also, with the QWERTY keyboard available connecting to WiFi was simple and straight forward. The user interface (UI) will look familiar to anyone who has played with a NeoTV. I am not convinced that there need to be as many pivots as are available, with everything I care about on the first one and many of the channels duplicated. NETGEAR is consistently adding channels so there are many to choose from including Netflix, VUDU, YouTube, Pandora, HULU PLUS, and CinemaNow to name a few, but Amazon Video remains a glaring exception to the list and should be present. If some tweaking is required after first run, the settings UI is easy to find and navigate. There was not much that I needed to mess with here, but it was comforting to know that the knobs-and-dials were exposed somewhere. With Netflix and VUDU available, options for all-you-can-eat and targeted high-quality rental are provided so the pain associated with Amazon Video is really only important to Amazon Prime subscribers. Unlike the previous generation NeoTV, now Netflix is offered with 5.1 audio and subtitle support as well as one of the nicer episode navigation experiences (take a look at the House of Cards screenshots in the gallery) and the “Just for Kids” option. Unfortunately the decision to enter it versus the normal version needs to made each time, so not only is the startup experience slower, but some of the value is lost if you want to keep the kids out of the full catalog. The VUDU experience is standard VUDU, although 3D lovers will appreciate that the NeoTV MAX offers proper support for 3D titles at 24p with a 3D TV. 24p for other content is also supported, but only for local files (USB/microSD), so OTT and even DLNA sources do not benefit from the feature. The UI for browsing local files is very simple, but as noted earlier, the implementation was surprisingly functional for a device in this class especially when combining the NeoTV MAX’s container/CODEC competence with NTFS support (i.e. files can be larger than 4GB). Transport controls (e.g. fast forwarding) are bit clunky, and the last position in a file is not persisted, so it is best suited to watching movies or short clips from start to finish. For these reasons I can’t see it replacing a HTPC or full-featured local playback device (e.g. Dune), but for those without a device of that type, a small library, or less demanding requirements it can fill the gap nicely – especially when travelling. Where that feature under promises and over delivers, WiDi stands in stark contrast. Placed prominently on the box and marketing collateral, it simply did not work. The experience loaded, but the Sandy Bridge laptop used in testing could not detect it on the network, where it happily found and connected to NETGEAR’s PTV2000 dedicated WiDi adapter. While the Netflix UI itself is good, getting there is another matter – with it taking about 50 seconds to launch the experience to a useable state. In comparison, the Roku XS goes from home screen to Netflix navigation in under ten seconds. This is also aggravated by the need to select standard Netflix or “Just for Kids” each time. Browsing Netflix is not as slow as loading it, but it is not snappy either. Worth noting if you are impatient, but not bad enough that it should be included as a con given the more content rich nature of the UI versus competitors like Roku. Levels were correct, also blacker than black (BTB) and whiter than white (WTW) are passed to aid in calibration. Like the previous generation, the NETGEAR NeoTV MAX has a real standby mode where it saves about three watts compared to the “On” state. Overall, power consumption is consistent with a device of this type at about five watts maximum depending on use. NETGEAR provides IP control for the NeoTV MAX via iOS and Android applications. The Android version was tested and is shown in the gallery above. It works, but lacks a critical feature essential for any remote app – the ability to turn on the device you want to control. In the cluttered field of little black streamers the original NeoTV stood out because it supported HDMI CEC – and supported it well. The same cannot be said about the NeoTV MAX however, with its implementation not only lacking, but disruptive. Simply put, when it is attached via HDMI, CEC no longer functions for any device connected to the same ecosystem – rendering all of the features it provides inoperative. This issue was reported to NETGEAR several months ago, and given the severity I expected that it would have been addressed by now, but unfortunately that is not the case. While the NETGEAR NeoTV MAX’s UI is a little sluggish and the overall experience could use some polish, it is easy to see the value that it provides in the realm of OTT services, DLNA and local file playback where it supports a wide array of file containers and codecs as well as native 24p for local files. Even though the remote is lacking in tactile reward, and is somewhat clunky in use, at the NTV300SL’s price point a bundled full QWERTY remote is outstanding. Obviously, a more solid controller would be preferred, but judging too harshly on this point is unjust given the MSRP. The same cannot be said about the way the device disruptively handles HDMI CEC, rendering the communication bus effectively useless. Were it not for this issue, it would be a straight forward exercise to weigh the pros/cons and find that the MAX delivers value in excess of its cost, but for anyone who relies on HDMI CEC it simply has no place in the media stack. Looks like Pulse-Eight makes a cable that can remediate the CEC-breaking “feature” of the NeoTV MAX.